You usually expect a Star Wars review from Sean Teeter, but tonight he turns his attention to the 12" version of Vampire Hunter D. Take it away, Sean! It’s been about three years since Vampire Hunter D: Bloodlust hit the screen. When this long-awaited sequel came out, there was a sudden explosion of renewed interest in the tales of D –at least among anime fans. Bloodlust is somewhat based (loosely) on the third story of the Vampire Hunter D novel series and introduces a whole new slew of characters. Besides D himself, the only other familiar “face” is Left Hand, the parasite living in D’s palm. While several anime fans thought the story wasn’t as good as the first, most mainstream viewers thought Bloodlust had a more cohesive plot. One point not up for debate was the artwork –the look of the film was stunning in comparison to its predecessor, as well as being a lot closer in feel to the original Vampire Hunter D artwork created by Yoshitaka Amano. Epoch in association with Cworks was given license to produce a small series of action figures for this line. 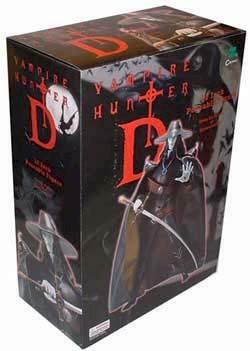 Previously available were two 1/10th scale actions figures of Vampire Hunter D and Leila, which I have previously reviewed. Finally the last of their planned figures has hit the shelves: the sixth scale Vampire Hunter D.
Simple and collector friendly best sum this one up. D comes packaged in a plastic tray inside a decent-sized boxed with an opening front flap. The photo art is a little redundant in places. I would have liked to have seen some Amano artwork or maybe some shots from the movie on the outside as opposed to repeated shots of the figure itself. What can I say? This is definitely Bloodlust’s D. The head sculpt is right on the money and looks absolutely wonderful. The only problem is with the hair. It seems a tad short, but that’s okay. I understand wanting to capture a certain look with the sculpted hair, but it really inhibits the neck articulation quite a bit. The hands also look nice. The right hand grip is too wide however and D has some trouble holding his sword. The left hand sculpt has D’s parasite in a more relaxed position than the alternative hand. What can I say? Despite the rather blah body costume, the paint on the face and hands is very nicely done. The pale skin and highlights all serve to bring D to life. Even though the body’s off, the head and hands are dead on when it comes to the source material. The gold highlights on the body are a little hit and miss, but it’s not a big deal. D may have over 20 points of articulation, as the box says, but he seems to be rather immobile for a sixth scale figure. His head is severely limited by his hair. His jumpsuit also limits basic hip, waist and shoulder movement. What I really don’t like about this figure is the sloppy way Epoch articulated the forearms. D’s actual arms end in little stubs a little ways after the elbows. The bodysuit caps them off at the ends. The sculpted forearm gauntlets are then shoved on, over the plether-covered stubs. While this makes it slightly easier to change the left hand sculpts, both sides are like this. If D take a fall from the shelf, you might have to look for his arms on the floor. And he probably will take a fall. D can barely stand up by himself. His tiny, unarticulated ankles and small feet aren’t enough to hold up such a top-heavy figure. Currently, mine is borrowing the stand from Sideshow’s Evil Ash figure. I had issues with D in the tenth scale line when it came to this category, and I find that nothing ‘s really changed with the larger figure. D comes with his sword, scabbard, and an extra left hand sculpt. For the average price tag, this seems a little lacking, but in all honesty, what else could be included? A removable hat would have been nice, but it’s not necessary since D never takes it off in Bloodlust. I’d love to see some sort of deluxe, boxed set with D and his cybernetic horse, but I think that would work better for the tenth scale figure. The sword feels very flimsy and bendable, including the hilt and handle. I don’t mind that the blade is flexible but the handle? The soft rubber just detracts from the object. The sculpt is also slightly off; I prefer the one on the smaller figure. The scabbard is okay, but has a little too much space inside for the sword to rattle around. The molding line is also very predominant, and looks sloppy. I do like how Epoch decided to attach the scabbard however. In the movies, it’s never quite clear how the hell D keeps his sword attached to the back of his cape. In the tenth scale figure, it’s just glued on. Here, the scabbard is completely removable and slides through two loops in the outer section of the cape. It works very nicely. The alternative left hand sculpt is very well done, as are the paint ops. He looks just like his movie counterpart. There is an interesting combination of things to be found in D’s gear. The bodysuit itself looks like D borrowed some clothes from the X-Men’s closet. He comes with a black plether jumpsuit, a sculpted belt, a sculpted bandolier, sculpted forearm gauntlets and boots, and his cape. The jumpsuit looks kind of plain, and there’s almost no detailing to be found other than the waist and kneecaps. It’s hard to capture the physical look of D’s sleek form without a specially sculpted outfit –something that the body sculpt on the tenth scale figure had no problem with. The boots and gauntlets look nice enough, but D’s feet seem a little too small, especially when it comes to supporting the figure. The real winner here is the cape. On the outside it’s shiny black plether. The inside is lined with a nice soft yellow fabric. The contrast between the two looks very nice. Instead of hooking around D’s neck, the cape snaps onto his shoulders to affect the draped look of the movie. The fringe of the cape is also lined with bendable wire, so you can control the way it hangs off of the vampire hunter. The way the forearms are done is just sloppy at best. The sword is also somewhat flimsy, and the uneven seam in the scabbard doesn’t look great. However, the head sculpt is really top-notch. I feel that besides the small flaws, he’ll stand the test of time –provided he’s using a figure stand to hold him up. Not to mention, he can barely hold his own sword . . .
Two stars is if you pay $30 or more for him, which seems to be the average price with Internet retailers. However, I got him off of eBay for $19.99. At that price, I’d go ahead and snap him up, especially if you’re a fan of the series. He’s not too common of a figure, and you probably won’t find him in many stores offline. D is a three star figure –no more, no less. While his over all appearance looks good, the lack of detail and flexibility brought about by his bodysuit really subtracts from the figure. Being unable to stand up on his own very well also seriously detracts from his final score. However, the wonderful cape and head sculpt really give him some personality. If you’re a fan, go ahead and get him as cheap as you can. Just make sure you invest in a stand to keep him upright. - Entertainment Earth has him for $30. They also have a few available in damaged boxes for just $27.